Greg and his friend and fellow PCT hiker Paul Hacker drove us for 3.5 hrs down to the tiny town of Campo near the Mexican border with California. 70km inland from San Diego, the border area is one of rolling arid hills covered by chaparral bushes and was surprisingly chilly as a wind blew grey clouds across the sky. A cluster of chiselled wooden posts marks the PCT terminal, set beside the strip of barbed wire fences and jeep tracks of the US/Mexican border. A US police border patrol jeep was driving around watching for Mexicans trying to cross over to the USA- I think that they could tell quite easily that we were not what they were looking for. Godie, a fellow hiker, was standing there with a couple of friends, the first of many hikers we would meet on our travels with the same inspiration to cross America. He, it turned out, was starting his walk tomorrow and was at the border to take some photos. After some photos of our own, we set off from this inauspicious spot at 13:10 25th April 1998 with feelings of relief and nerves. I felt a bit of a fraud as the ball of my left foot squealed with pain each step and I just hoped to get far enough not to seem too stupid. As we were to find out many times along the trail, often the best solution was just to keep walking and not to think too much about how hard/sore/long it is!! Greg and Paul watched us stroll off through the bushes, I think somehow a bit envious of our adventure but knowing also that many hard times were in front of us. It was difficult, for me especially, to take in that we were actually off on our journey and on that first day my way of dealing with it was just to keep going on and on. Stopping for the first time for some food on a blunt ridge top after a hard 5 hours, Martina politely enquired if this was the way we intended to continue! No, we agreed to take regular stops on our way, it was just felt good for me to get distance under my belt. From our stop we were able to gaze over the type of country which we would come familiar with over the next few weeks. Back south we could see sandy rounded hills well into Mexico. To the east the land stretched hazily out towards hot flatlands and the Salton Sea, an artificial lake. To the north and west the land broke up into further ridges and hills each marked by eroded, dry river valleys giving a rippling effect of shade and sun. A ranch below us, Hacienda Del Florasol, provided a pleasant splash of green on the arid landscape. The rock in Southern California is mainly coarse grained granite which erodes into a light coloured sandy soil. This supports little of the green grass we were used to in Scotland and contributed towards the typical arid landscape. We stopped that night beside a tiny creek, high up in the hills after walking a healthy 18 miles and camped in the dark, right on the path, on the only flat patch we could find. Tired but satisfied. The next day and a half we walked over undulating hills covered in scrub. Our main adversity was the afternoon heat and the hard merciless ground of the trail. The combination made the soles of our feet ache such that when we first stood up in the morning we felt like we were standing on a bed of hot coals! 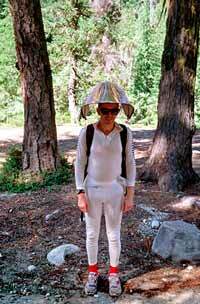 In the morning we met our first other hiker, also intending to walk to Canada on the PCT (we are called thru-hikers here in reference to hiking ‘thru’ different states to cross the country). Kojak from Tennessee is a veteran of the Appalachian Trial in the east USA and had a deep drawl, which required 2 or 3 takes, but a nice guy. In those first few weeks we met few others on the trail itself but bumped into other hikers in towns nearby. 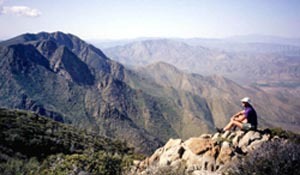 We continued on with Kojak to climb further into a range called the Laguna Mountains. Here we rejoiced in a change of landscape and our first pine trees as we climbed up to around 6,000ft. The difference in the environment around these Jeffrey pines was staggering compared to that of the chaparral- the trees provided delightful shade and gave off a sweet smell which was to form a lasting evocative memory. As we wandered through, our gaze would be caught by the tremendous symmetry of the trees reaching upward with a cathedral like architecture. Fortunately, in these southern areas the forest consisted of well spaced out trees which allowed distant views unlike some of the deeper forest we were to encounter later on. 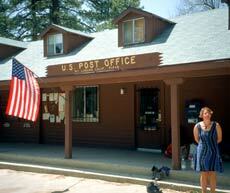 Our first mail drop had been arranged to a US post office at the small town of Mount Laguna. We had sent a package with food supplies to the post office and were keen to pick it up and buy some fresh food at the small store. Unfortunately it hadn’t arrived- our first mail drop of around 30 planned drops hadn’t made it and we were a bit worried that our plan of re-supply might prove unreliable. Luckily for us, two other thru-hikers, Jason and Joanne from Canada, were able to help out with some spare food, which would help get us to our next re-supply point four days and seventy miles later. The Canadians (or the 2-Jay’s as we called them) were a friendly couple who stuck to a vegan diet. This made shopping in small town stores quite difficult for them and they had chosen to prepare and package all their food in advance of their planned six month journey. This effort had lasted 18 months! – and even then Joanne stated that they hadn’t had time to finish the preparation completely. Martina and I, although vegetarians, had gone for a fairly minimal planning approach where we had pre-packaged food for the first 500 miles but decided to then be flexible and respond to whatever our particular special requirements were from then on. Time would tell whether our minimal approach would be sufficient. The four of us walked on for 4 miles to stop at a roadside campsite. We discovered on arrival though that it was still closed for winter and panicked that there might not be any water supply available. Thankfully after a bit of running around we located a water pipe and settled down. The site was located in pine forest with a lovely pine cone carpet and we discovered we had red squirrels as companions, dashing around our tents. It was still spring here and the temperature dipped well below freezing at night, the clear starry sky opening up to let the scorching daytime heat escape. 2-Jay’s Attached to the umbrella surface was a silver shiny plastic- much like that used in food wrapping- which reflected the sun. 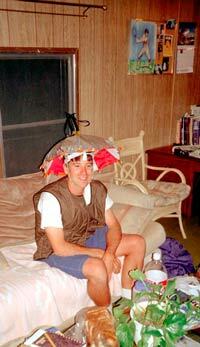 The umbrella was carried by hooking it onto a holder on the rucksack shoulder strap. 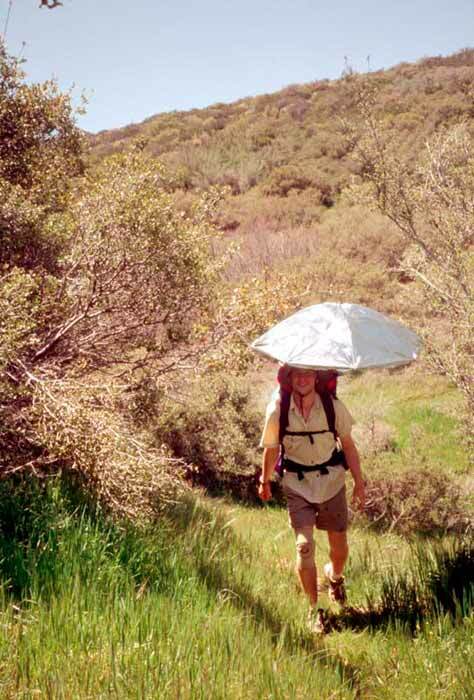 A good idea but a bit prone to windy conditions- I thought it would never catch on in Scotland! Hikin' Mike Mike had gone for this self constructed model which was attached by a band round the forehead and supported by a chinstrap. He had cut down a standard umbrella I think. Again, a covering of silver foil was used to reflect the sun. Very practical we thought and a good design. Marathon Man A forward leaning design which looked to be based on a table lamp! 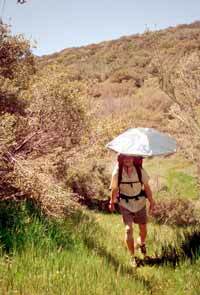 The shade was held by rods fitted onto the rucksack straps. The whole unit had the unfortunate effect of swaying back and forth as Marathon Man walked. This gave him a somewhat 'otherworldly' look. We stayed high for a while on a great escarpment which dropped steeply to our east down to the plains of the Anza-Borrego desert. Water was in short supply and we had to plan carefully how much water we had to carry with us before we could reach the next reliable source. 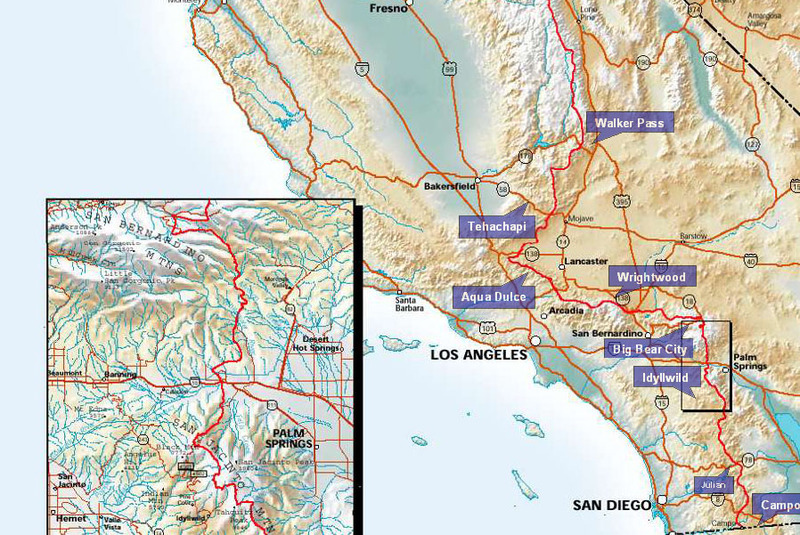 Our guidebook of the PCT provided very detailed information on this topic and we were able to make fairly informed decisions as to where water sources would be. Some of them involved striking off the trail for some distance though, and this often added hidden miles to our daily tally. Our stove had been spluttering since the start of the trail and we began to get a bit concerned that it would fail completely after having no success with cleaning attempts. Since our evening meals consisted of lightweight dehydrated foods we were dependant on the stove for cooking as these dishes were inedible otherwise. We soon made a decision to exit the trail at the next road (Scissors Crossing) and hitch-hike to the nearby town of Julian to try and fix the stove before returning to the same point to resume the trail. This was to be our general ethic for leaving the trail – we could leave at any point and take any form of transport, but we must return to the same point on the trail to leave a continuous line of footsteps. I had heard of a hiker who took this ethic one stage further and would mark the trail with a stick or pile of stones before he left and insisted on touching the marker before resuming his walk. Not for us, but we wanted to walk the whole journey and realised if we loosened our ethics here it could easily degenerate to hitching large parts of the trail. Scissors Crossing at the junctions of Highway’s 78 and S2 at the bottom of the San Felipe valley was a hot place at mid-day. The sun seemed to enter into the valley and never escape. We reached here by dropping down from the hills onto the flat, dry valley floor until we reached the road junction, its placid polluted looking river at least providing some trees for shade. Reluctantly we had to give up the shade to hitch-hike on the road and were soon heading for the town of Julian, 10 miles west. The journey out of the valley to Julian provided a remarkable change in climate and vegetation as the road climbed away from the hot valley floor through a twisting hill-lined alleyway. Julian was cool with greenery and has a hill town feel to it. The streets had a bit of a western movie set, just constructed look, but we took to it and settled down to a night in a motel, soft bed and civilised meal at a table. 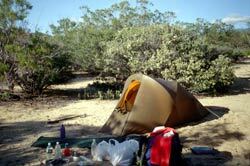 We noted how quickly our attitudes had adopted to living in the outdoors and, although we had only been walking or camping for less than a week, the tent now seemed like our normal home. We returned to the trail the next morning after failing to fix the stove but feeling hugely refreshed and cleansed after our stopover. Our attempts to hitch back out of town were appearing futile until we saw a lone man walking out of the town on the road towards us. People walking any distance is a rare sight here so we perked up and took notice – was he going to reprimand us for hitch-hiking (we were not sure if it was entirely legal) or was he an American ‘crazy’? It turned out his name was Jeff, he was retired in Julian and a hiker interested in the PCT. He was keen to chat about the trail and help us out by giving us a lift down to Scissors Crossing. A quick walk back to visit his wife in the town bakery, through the back of the bakery to his car, and we were on our way back to the trail. Jeff’s help was one of our first experiences of the tremendous generosity of the American people. The main surprise for us on the trail in the south was the abundance of wild flowers- the wet winter had some positive influence! 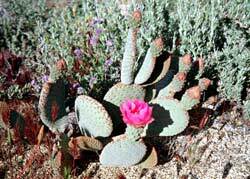 Cactus were springing to life, sprouting beautiful flowers of pink, yellow and blue. The desert floor was a vibrant carpet of flowers in places and even distant hillsides could be seen to shimmer colour from the bloom. I had never seen anything like it and ha dn’t even dreamed that the desert could be so alive. The Mojave yucca, agave, ocotillo and lovely teddy bear cholla were an inspiration to us, as in the searing heat they had managed to evolve and survive, and perhaps we could too. Wildlife was also surprisingly abundant. Lizards and snakes sheltered under the bushes, ground squirrels and chipmunks dashed out of the way when they heard us, bluejays and chikadees were common and we saw coyote, deer and even mountain lion tracks in the sand. Jeff dropped us back at Scissors Crossing at midday to the foot of one of the most formidable sections of the southern PCT. 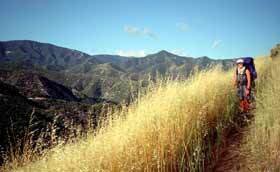 Our route ahead for 23 miles was waterless and over the San Felipe mountains- a range of hills that were not particularly high but their arid and shelterless nature meant that they had the respect of other PCT hikers we had spoken to. We climbed quickly, keen to put in some miles after our late start and, to our surprise, found a fresh wind in our faces. This cooled us during a long meandering ascent that lasted well into the evening. A glorious display of desert flowers kept our mind off the heat and we decided to camp in a small sandy meadow near the summit ridge of the range. I had taken to wandering around camp in my bare feet to try and freshen them up in the evening but was caught out as I stepped on a small cactus bush and squealed in pain as tens of tiny barbed spikes bit into me. Thankfully with lots of help from a patient Martina, we were able to remove them all before settling down to sleep. By carrying water up to a high camp, we had split the San Felipe mountains into two manageable chunks and we set off at an early 6.30am to walk the last 15 miles down to the next water supply at Barrel Springs. Our breakfast stop was enlivened by a tremendous display by a hummingbird which would hover high above then swoop down near to us to stop 10 meters away and hover again. We thought it might be some sort of defensive strategy so we moved off soon to leave it alone. Walking was tough with the heat and the hot hard ground and we both were relieved to reach the springs around midday to settle down in the shade for a good siesta. Around 3pm we headed on over a strange landscape dotted with granite tors and past some cattle grazing on dry arid fields. It wasn't till seven days out, north of the small town of Warner Springs that we came face to face with our first real mountain ranges. Snow covered San Janquinto (west of Palm Springs) at 10,000ft dominated the view to the north. We headed for it with enthusiasm, for it meant cool mountain air, shady scented pine forest and the adventure of high mountains. Two days later we were climbing its southern ridges- the Desert Divide - in deteriorating weather. We made it to a grove of red barked cedar trees at 6,800 ft to camp after our longest day yet at 23.5 miles. Next day the wind had turned stronger but we set out in the shelter of trees. A path marked on the map seemed to be a short cut back to the main trail - instead it presented an exhausting bushwhack through wiry manzanita scrub. At one point we had to crawl ahead without our rucksacks to find the path junction. It was a scraped and ruffled pair of hikers that eventually slumped on the trail. After this we brushed ourselves down and ascended more easily along the undulating ridgeline but amidst worsening winds and rain. Large patches of winter snow soon appeared and we made good use of the ice axes we had carried since the border, as the path contoured round the side of the summit ridge on steep slopes. The heavy rain and wet snow easily saturated our pitifully lightweight desert clothing and we were soon pretty miserable, keeping warm only by constant movement. Much to our surprise a figure appeared out of the shifting mist and rain, heading towards us. 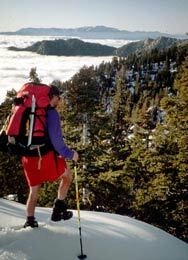 It was Brian Sweet, another thru-hiker who had turned back as the trail was difficult to follow on the snow covered steep slopes ahead. We decided to go back up the trail to attempt the snow again together, but soon gave up because of the severe conditions. Eventually the three of us retreated back to a wet cold camp beside the trail in continual rain just below the snow line. That night was miserable as much of our gear was sodden wet. Martina's foresight of storing her gear in extra plastic bags paid off as she had the only dry clothes of the three of us. 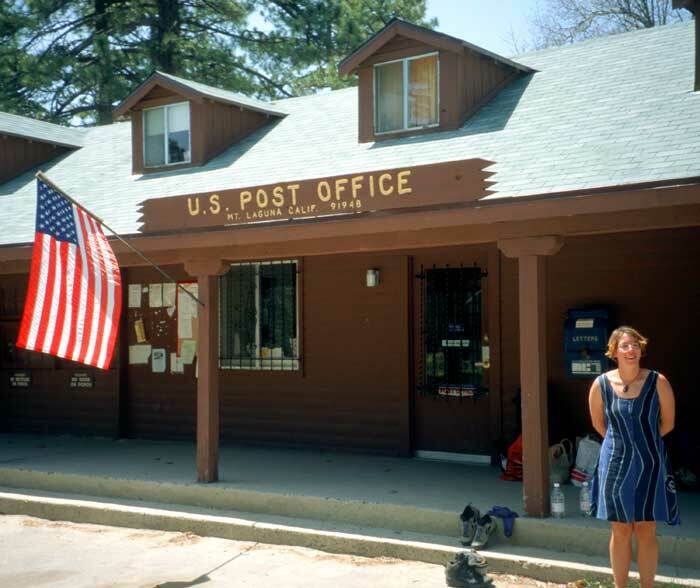 At 6am the next morning we set off to retreat the 10 miles back to the road toward the town of Idyllwild. 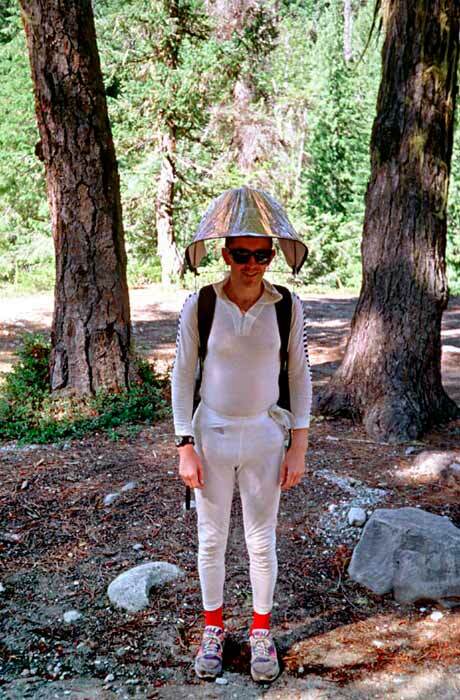 Brian said he’d had no sleep at all in his 'bivvy' bag and had done sit-ups to keep warm during the night! In Idyllwild we were able to dry our soaking clothes, warm up and eat with a vengeance. We also met a few other PCT hikers, as most seemed to be resting up out of the stormy conditions. Here we met Mike and Lynn (in the laundrette), Tony from London, Tahoma and Janelle from Washington, and Carl and Dotty, who had been laid up for a week after Dotty had come into contact with the feared poison oak plant which causes a horrendous skin rash.